We have been working with series of books in Readers’ Workshop lately. Our newest unit, which has a focus on patterns, characters and changes, is asking students to look at a series of books (one per group) to find similarities and differences. 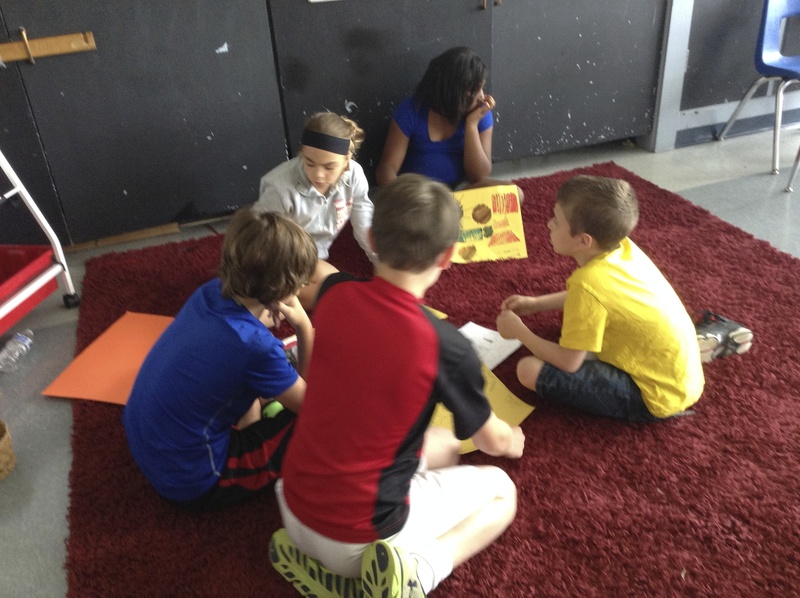 Each kiddo in the group is reading a different book (which is something I’ve never done before) and when they meet, the team is responsible for talking about what they’ve each found in their books individually. 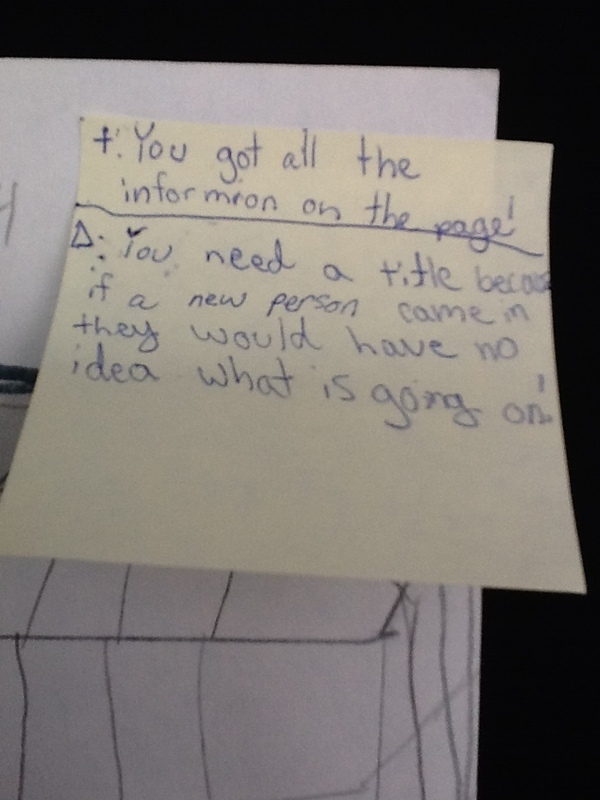 We’ve worked on looking at what is always the same (patterns in the series), what we can learn about characters, asking ourselves why certain things are important, marking the text with post-its so we don’t forget what we’ve noticed, talking “long and strong” about our post-it notes, making sure we understand what our partners are saying by asking clarifying questions, and using a Venn diagram to model what we notice between the books in our groups. We’ve chosen books series that match each level of reader in my classroom: Horrible Harry, Roscoe Riley Rules, Berenstain Bears, Clifford, Mercy Watson and Little House on the Prairie. It’s been really exciting to see what they’ve been able to do with this study. For many it’s the first time they have really read a chapter book. 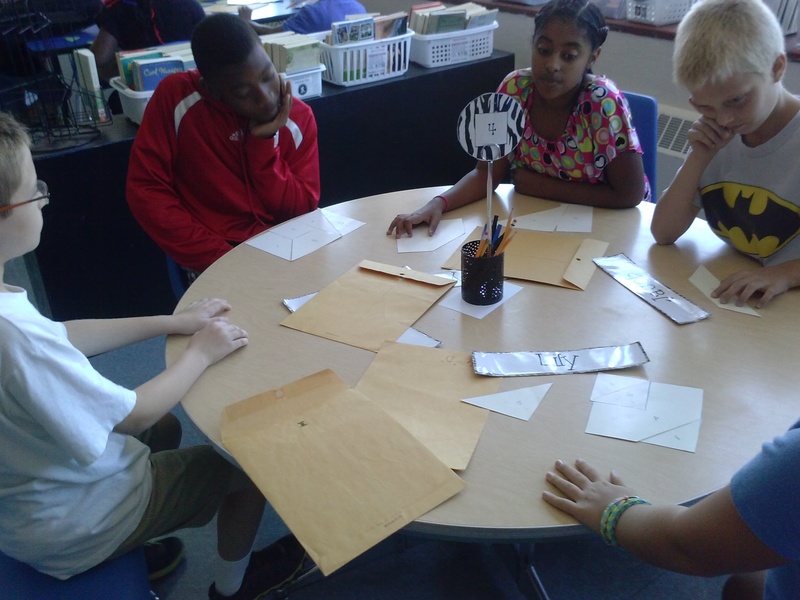 While each group has different conversations based on the members and the books, each works with diligence and purpose as they discuss what they are learning about their texts. They are really thinking deeply about their books, having fun with literacy and their reading conversations are leaking over into other parts of our day. The other thing I’ve seen is that many have been positively pressured to higher levels of thinking and participating because of what they see their friends doing. Love that kind of friendly competition! I know this kind of thing would be best explained with videos, but all I have is pictures. Imagine that you can hear quiet murmurs of engaging conversations around books that kids love and it would sound just about right! 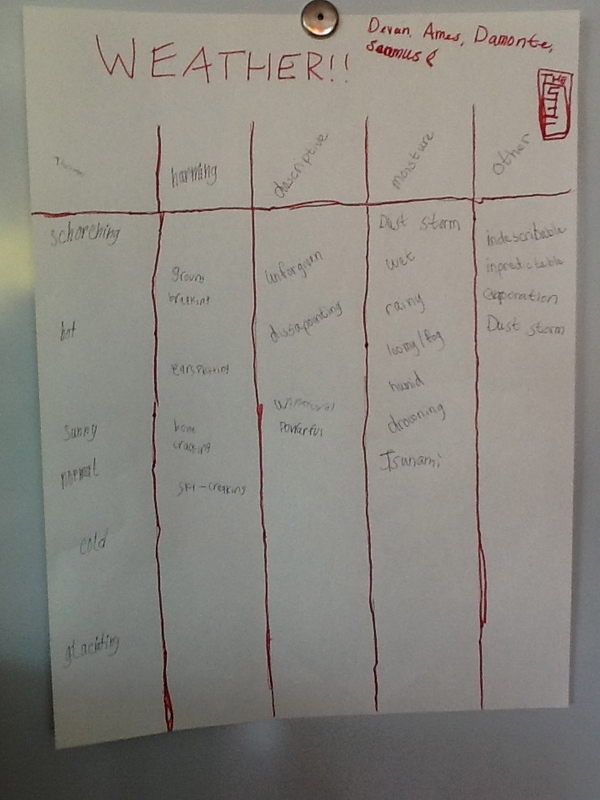 There seems to be a theme in my 5th grade class…. (I’m not sure if I should take it personally, or just be really impressed that my kiddos are so creative….). Today was a day full of lots of things: learning, noise, fun, business, reading, noise, creating, collaborating, noise. But luckily most of it was not just what I call “noise noise.” Much of the noise we made today was “learning noise.” Noise that indicates lots of thinking and creating and sharing is happening. And yes, it was loud. But sometimes that’s just how we roll. Especially when there are 25 of us in the room all talking at once! So back to the theme I mentioned….we had to stop at one point today and regroup a little bit. Writer’s Workshop was a wee bit rocky, and so rather than fight against the trouble we were having, we stopped, gathered together and agreed to try that lesson again another day. Instead, I had them help me with a problem. I told them that I need their help to figure out how I could help them best be learners during our last few days of 5th grade. We have work left to do, and we want to try to have a little bit of fun, too. 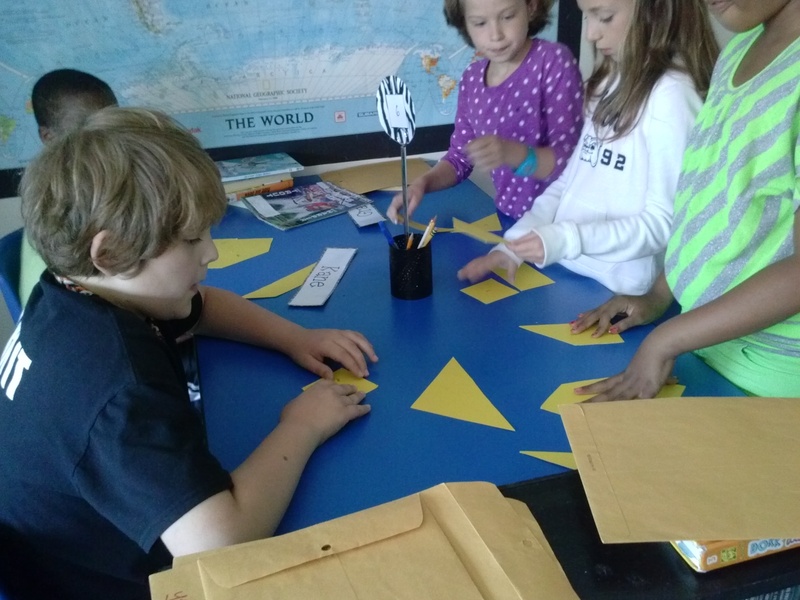 They had some great thinking, which culminated in the idea that parts of our classroom (or how they were using it) were not really working for us. We agreed that we could work together to fix that problem and create a space that we could do some amazing end-of-the-year work in for a few more weeks. 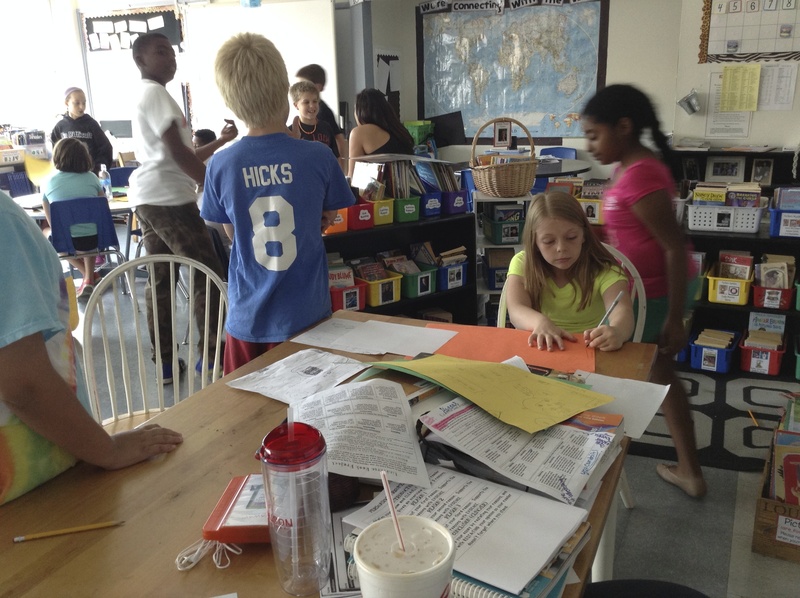 We started with every kiddo creating their own dream plan of what our classroom would look like. 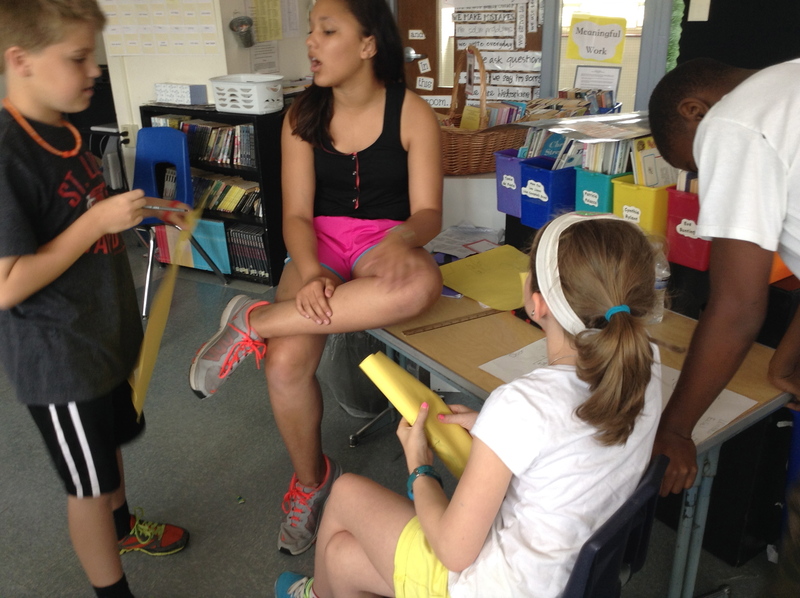 Then kiddos met in their tribes, presenting their plan to the 4-5 kiddos in their group. From their, the tribes created a new plan incorporating the best features from each individual plan. 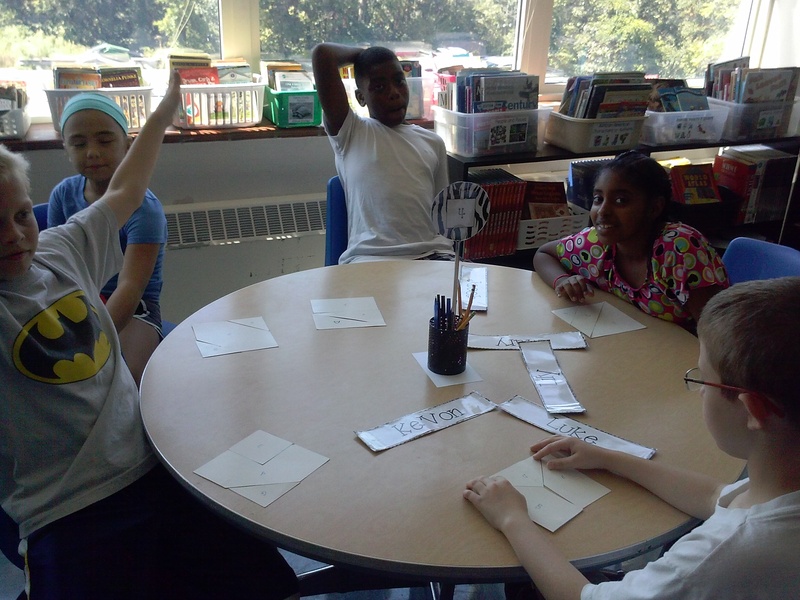 Then we shared out as a class, and voted on the one we thought would work best for us. Here’s what is sounded like during that time. Remember, it’s loud, but it’s not. just. noise. 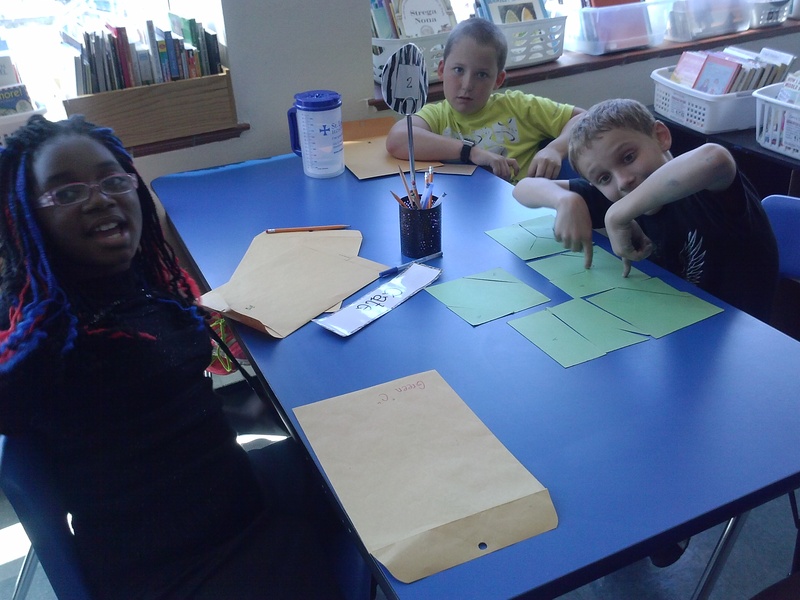 They are busy solving problems! Can’t wait to share the final product next week! Seems like another theme this week is that I forget to take “after” pictures! Stay tuned! 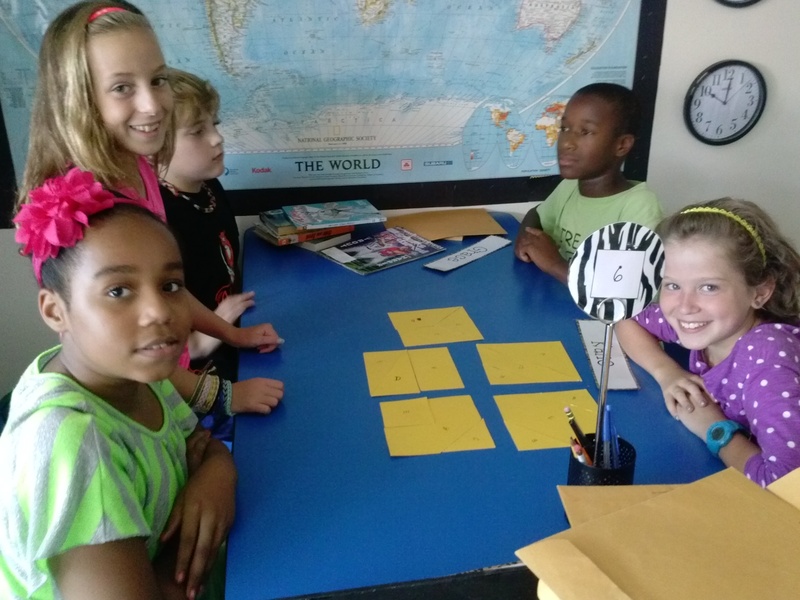 The basic premise of the game is that each person in the group has a folder with pieces of different squares. 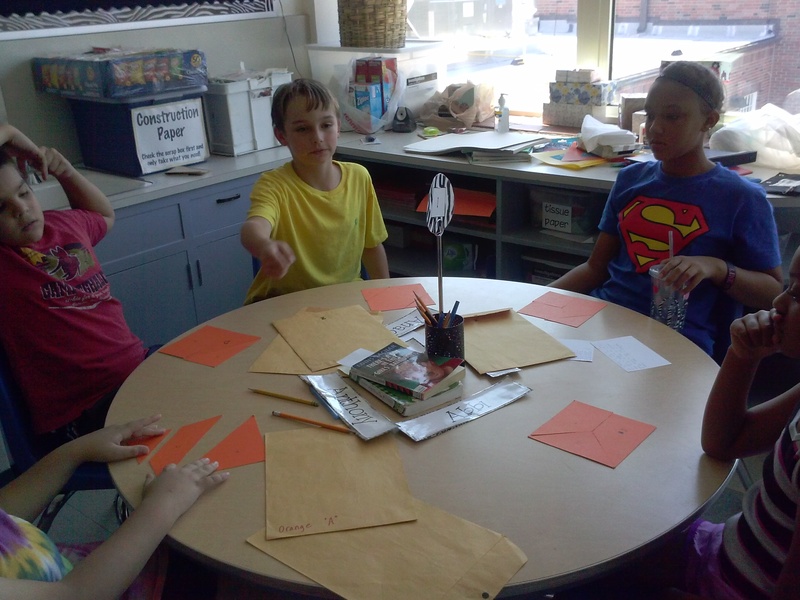 In total, the group needs to end up with 5 equal-sized squares. The catch? No one can talk. You can’t ask anyone else for pieces, but you can give pieces to other people in your group if you think they need them. At first, this was a really tricky task! The biggest problem? Everyone was trying to do it on their own! Pretty much the opposite of how the game works! You would not believe the sounds I heard during this activity–it’s too bad I didn’t take any video. Most sounds were moans and groans as they tried to figure out what to do, except for from Table 6 (see above)–their group had “tweeting” or “chirping” sounds happening during this task. I soon figured out that that was the sound of them digging deep to find their grit. Whatever works, right? Eventually it was time for lunch, and so we left to chow–and left our game just as it was, planning to return after we’d had some time to breathe. As I was sharing the story of our struggle with some friends at lunch, Mrs. Berger said something about needing to see things in another way. This was genius! It gave me an idea for how we could switch things up after we came back. 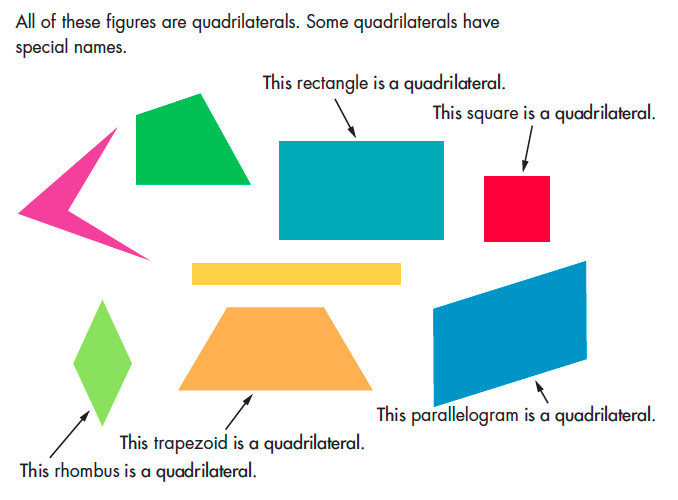 Talk with your group, then explain with precise mathematical vocabulary, the difference between these polygons: quadrilateral, parallelogram, rhombus, rectangle, square. Tell how a shape can have more than one of these names at a time. 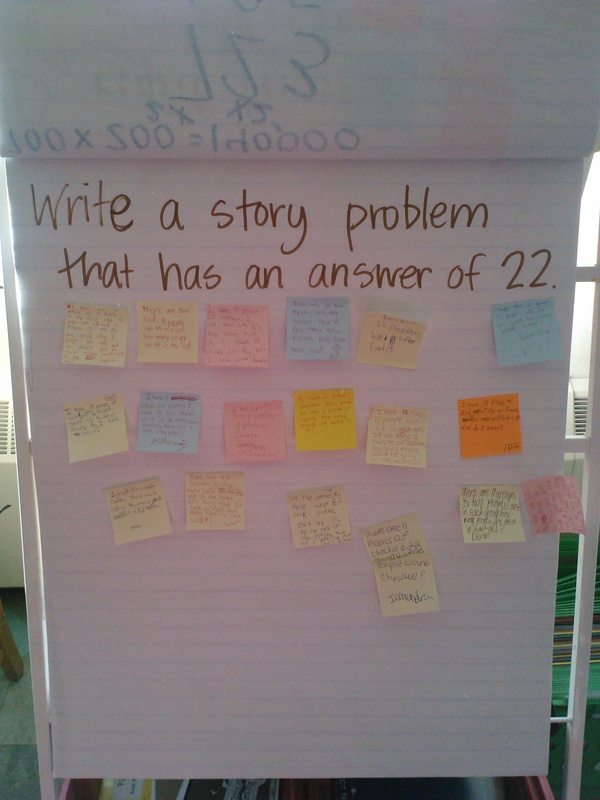 Your job today is to come up with a story that uses FRACTIONS and has an answer of 3/4. Work together with your group to write one, and if you have time after that one, write another! Leave your story in the comments for this post, and be sure to leave your names! You may have heard me or my students mention the Box Factory lately, and wondered what in the world we were talking about. 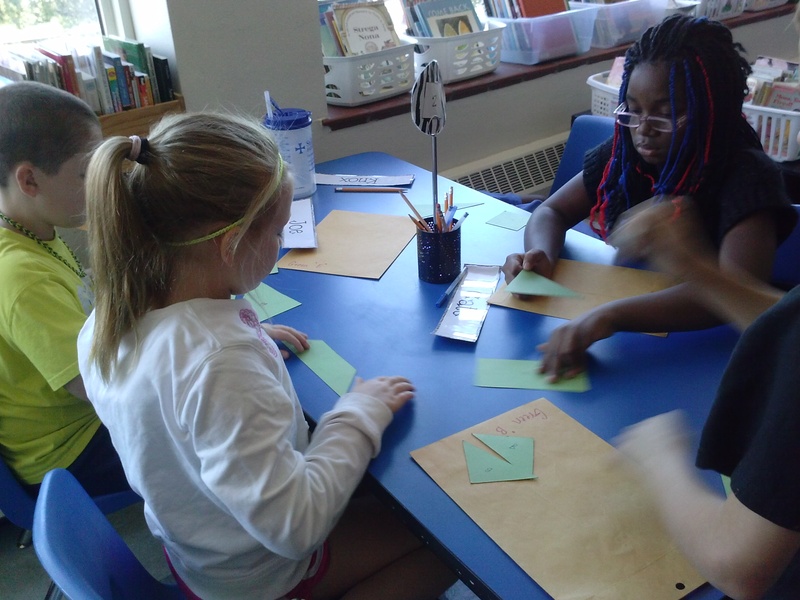 Let me tell you about this fabulous math work we’ve been doing lately. 1. If the box factory wanted to create boxes that held 24 items, how many different boxes could they create? What would the dimensions be of those boxes? Which box would be the cheapest one to produce? There were 16 possible answers to this question, and the students used cubes, graph paper, equations, drawings, or whatever necessary to figure it out. 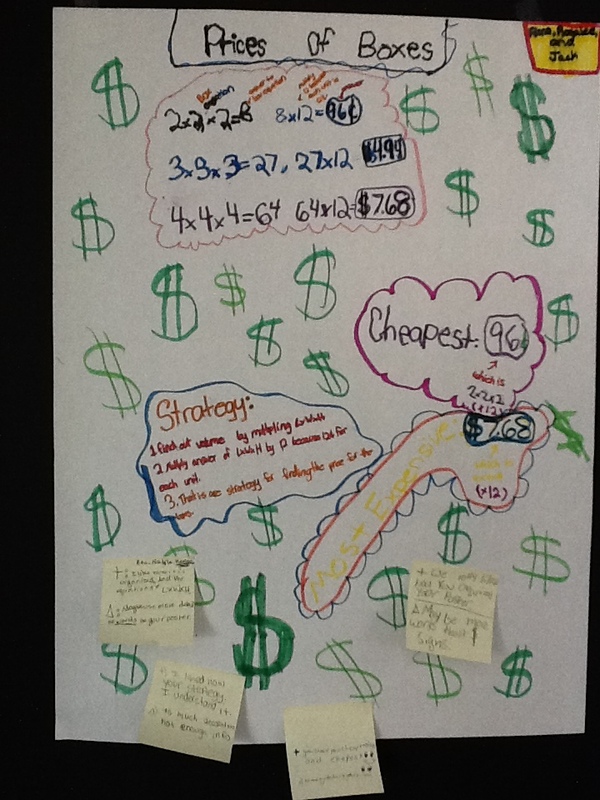 They had to then create a poster to show their strategies and explain their thinking to show to the other groups. 2. How much cardboard would you need to cover each of these boxes? 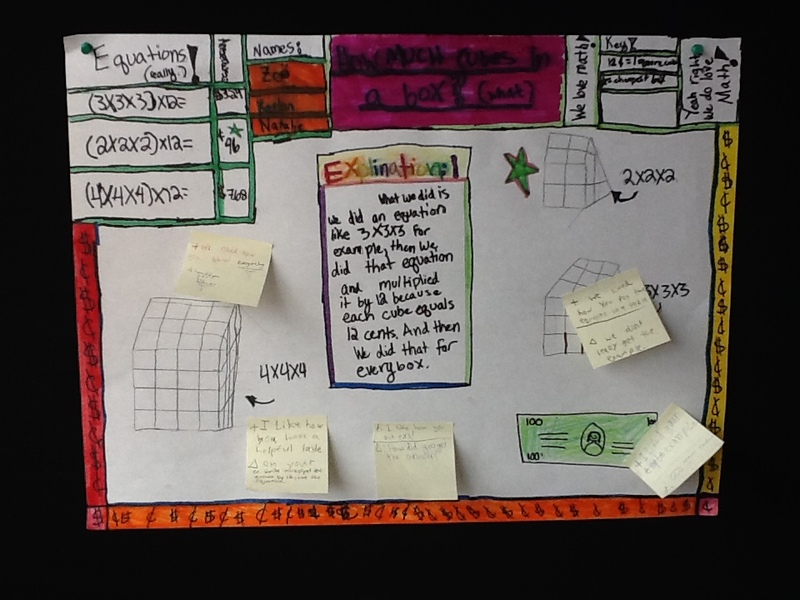 This one extended the conversation into surface area, and invited students to now look at the outside of the box, instead of just the inside. 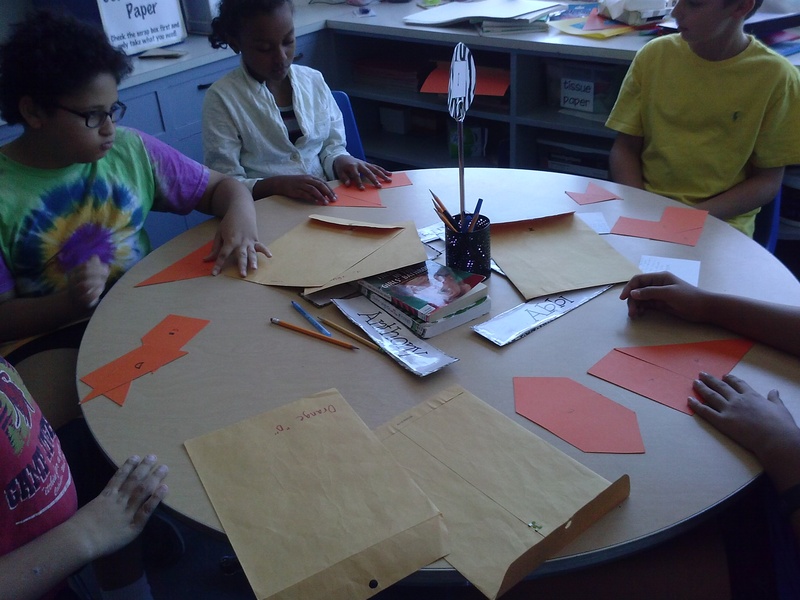 Most groups figured out that if they used the formula (2 x L) + (2 x W) + (2 x H) to determine how much cardboard they’d need. The cheapest boxes to make would be ones that are closest to the shape of a cube, as opposed to a long, skinny box. 3. 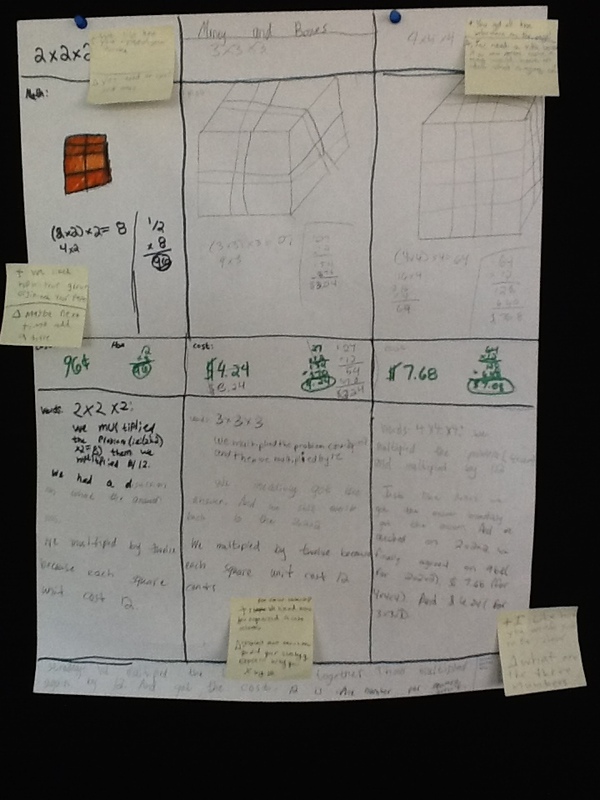 If the factory created three sizes of cube-shaped boxes–2 x 2 x 2, 3 x 3 x 3, and 4 x 4 x4, how many units could each hold? If it costs 12 cents per unit, how much would each box cost? This one looked at the inside again, and added another layer of multiplication (with money) to figure out the final answers. 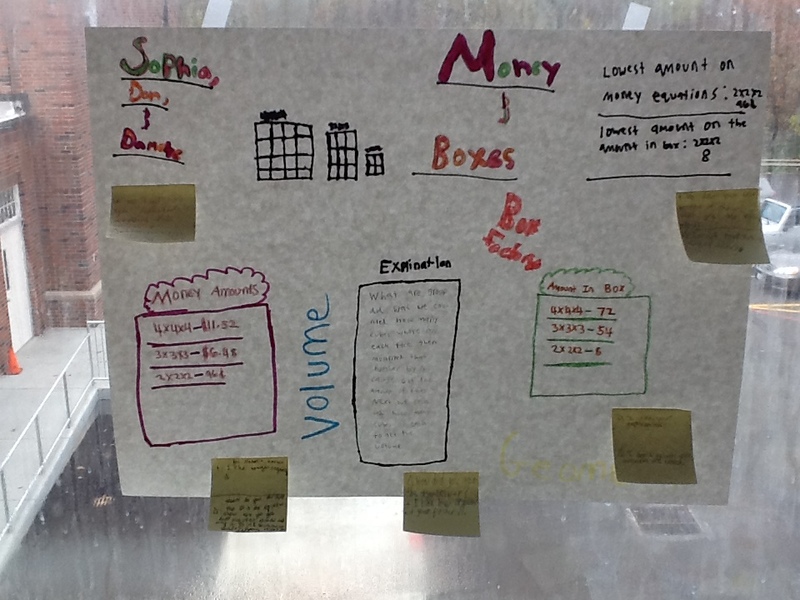 All throughout this investigation (which goes for about 10 days), the focus is on kids discovering strategies for volume, rather than just giving it to them. 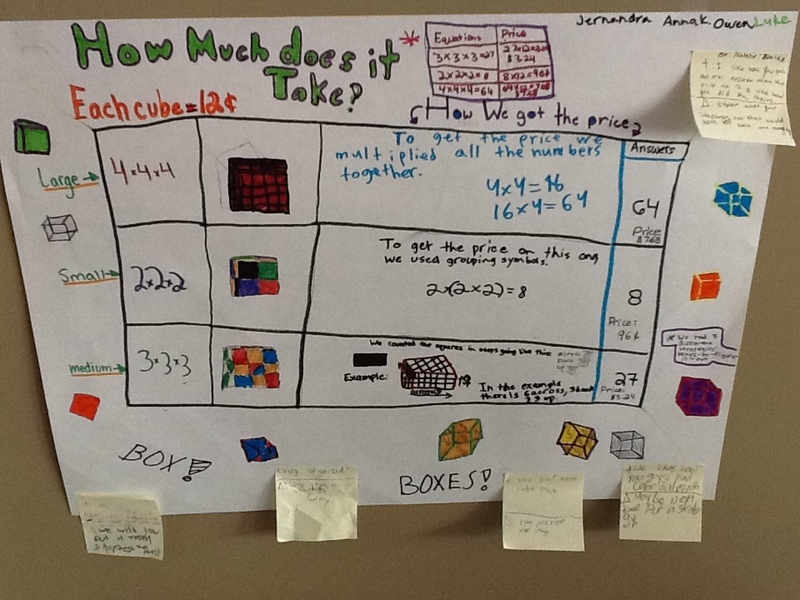 Through the posters they create and the Math Congress conversations we share, they are also working on sharing and representing their thinking. 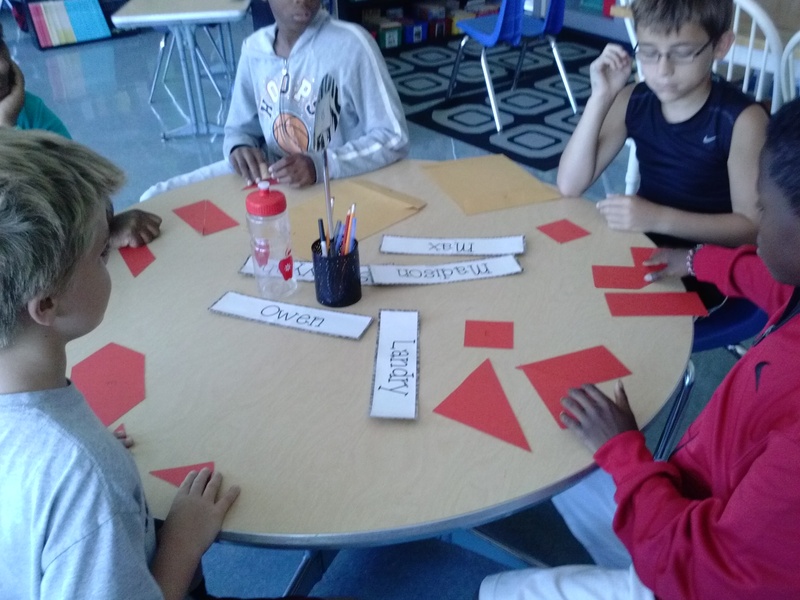 They are learning how to make their representations clear and concise so that other people can understand exactly what they did. Have you ever done a Cathy Fosnot unit before? 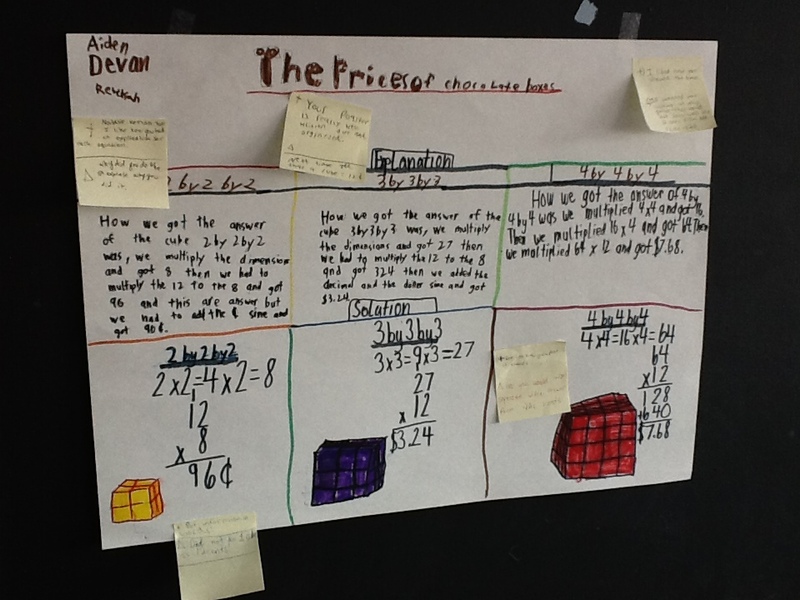 How have you used revision and feedback in math to clarify thinking? What strategies do you use for teaching volume? We’d love to hear about it! I wrote about this topic last year here. 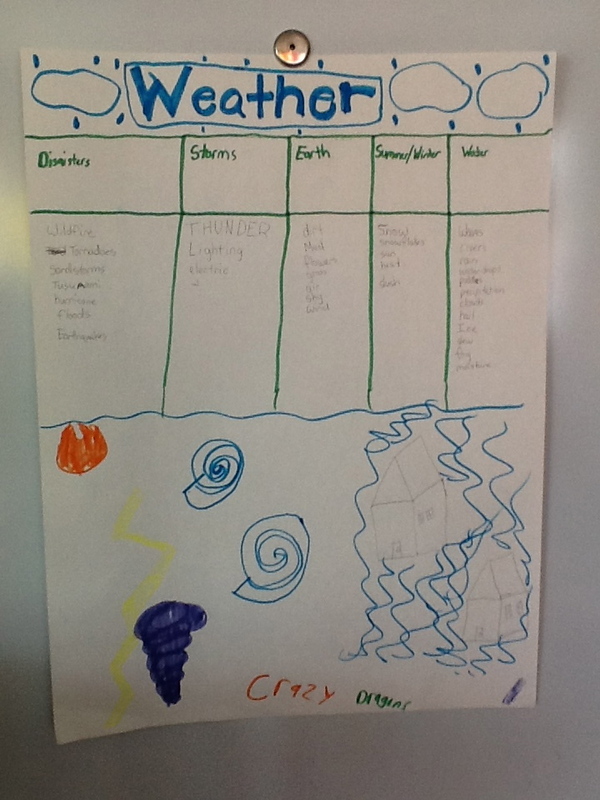 And like last year, I started my weather unit today with the same activity. But that doesn’t mean that our experience was the same. 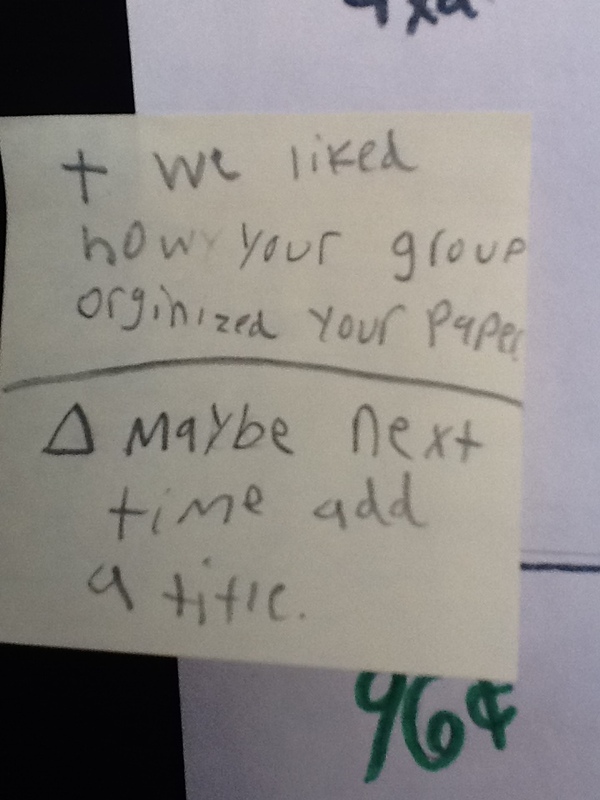 I have a different group of kiddos, with different knowledge and understanding, and I gave a different set of directions of how this protocol would work. So yes, it’s similar, as many things are year-to-year, but it’s not nearly the same. So, like I mentioned before, I had a couple of added directions this time around that helped further thinking. 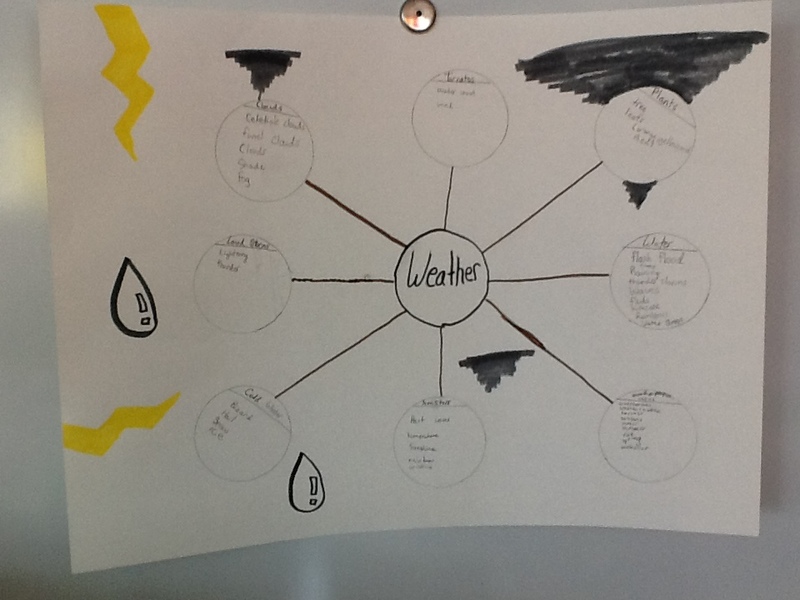 When tribes got to the GROUPing part, rather than tell them how to make their poster look, we talked about how they needed to make a decision about the best kind of graphic organizer to use for their information. 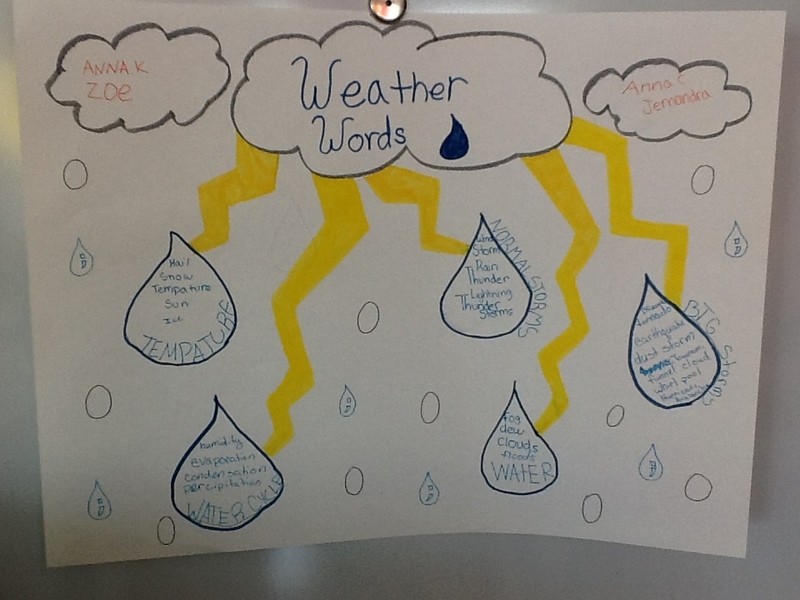 I also took this opportunity to introduce the phrase “You gotta build the house before you decorate it.” We talked about how you could “fancy” up your poster if you had some time at the end, but that the most important thing was to get your thinking down first, to show what you know about weather in an organized way. 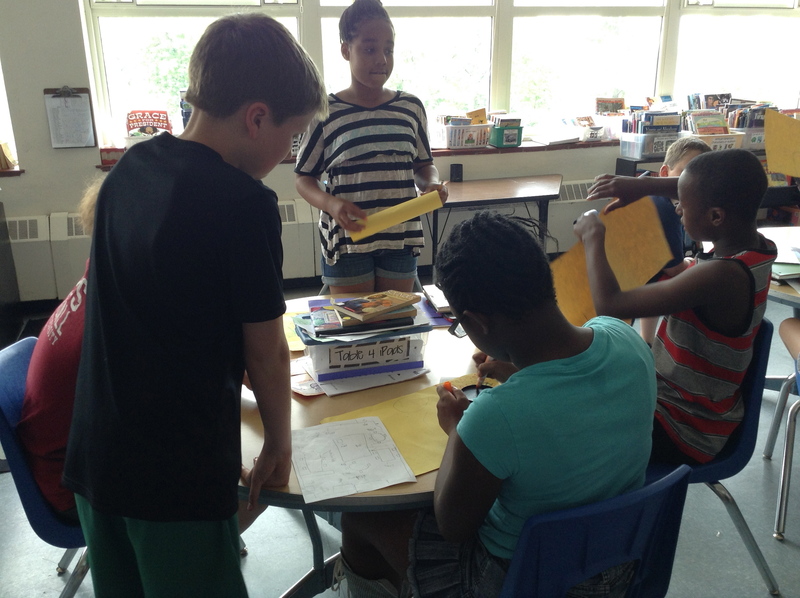 We spent about 10 minutes on the list-group-label part, then took a short gallery walk to each tribe’s poster. 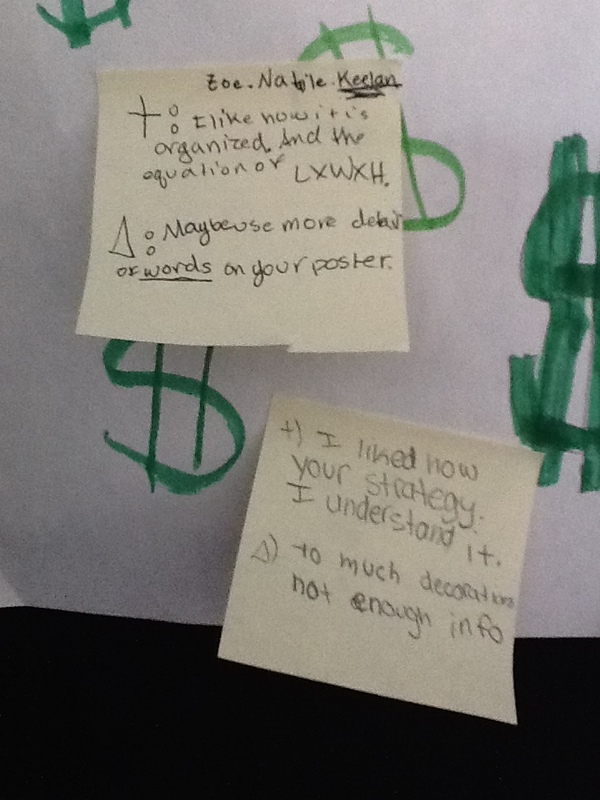 As they visited other posters, they were to notice what words others used, how they organized their thinking, and if there were any ideas they could “steal” to add to their own sheet once they returned. 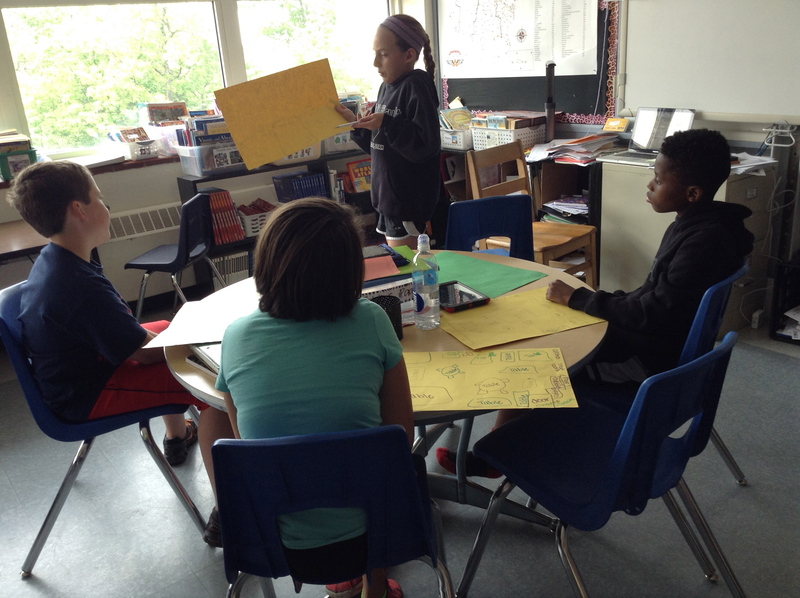 After spending about 30 seconds at each poster, they had two minutes to tweak their own work before we were finished. Please leave us a comment and let us know what you think. We’d love to continue to learn with you. What other words would you suggest we put on our lists?